Summary: Andrea Davis Pinkney’s poetic homage weaves together biographical information about Keats with the story of the creation of his most famous book. Born Jacob Ezra Katz, the son of Polish immigrants, the artist grew up in a poor Brooklyn neighborhood with a father who faced job discrimination and a mother whose secret dreams of becoming an artist never came to fruition. Young Ezra loved art and won an art school scholarship, but when his father died of a heart attack the day before his high school graduation, his school days were over. He was helped by the New Deal’s WPA, and went on to become a comic book artist before moving to children’s book illustration. When he was asked to write and illustrate his own book, he thought of a little African-American boy whose picture in Life magazine had hung on Keats’s wall for many years. This boy became Peter and the book was The Snowy Day. Back matter includes “Ezra’s Legacy” with more information about the books that celebrated city life and the people from different cultures who lived there, and “Keats, the Collage Poet”, explaining how the verse narrative used for this book reflects Keats’ collage style of art. 60 pages; grades 2-5. 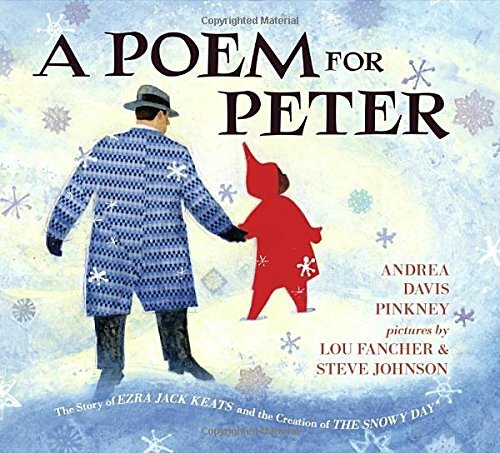 Pros: A beautiful celebration of a life and a book, illuminated with illustrations inspired by Ezra Jack Keats’s art. Cons: I find the poetic biographies are a hard sell with the elementary crowd.